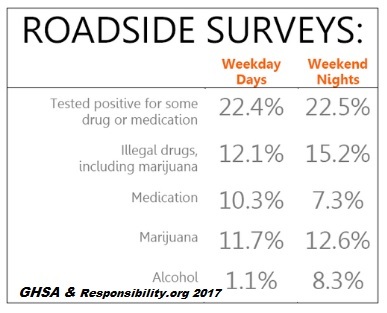 According to a U.S. National Library of Medicine/National Institutes of Health 2018 study, young adults, ages 18-25, seeking care in an emergency department, were surveyed about substance-use behaviors, including drugged driving. The study showed that nearly 25 percent of those surveyed reported driving impaired by drugs in the past year, and 96 percent reported driving after marijuana use. Also, 25 percent of drugged drivers reported engaging in a high frequency of drugged driving 10 or more times in the previous year. Recommendation 1: All law enforcement officers (LEOs) should be trained in the Standardized Field Sobriety Tests (SFST) and the National Highway Traffic Safety Administration (NHTSA) “Drugs that Impair Driving” curriculum. Recommendation 2: Authorize LEOs to collect specimens for alcohol and other drug testing for all DUI arrestees. Recommendation 3: LEOs should use oral fluid test technology on suspected drugged drivers. Recommendation 4: State reporting systems should distinguish between DUI-alcohol and DUI-drugs. Recommendation 5: Implied consent laws should extend to drugs other than alcohol. Recommendation 6: Authorize and encourage alcohol and drug testing for all surviving drivers involved in fatal and serious injury crashes. Recommendation 7: Mandate alcohol and other drug testing and reporting results on all fatally injured drivers. “Should you or a loved one be injured in an accident, we are available to assist you 24/7, and there are no costs or attorney fees unless we make a monetary recovery for you,” said Attorney Spivey. Fort Myers DUI Accident Attorney, Randall L. Spivey is a Board Certified Trial Attorney – the highest recognition for competence bestowed by the Florida Bar and a distinction earned by just one (1%) percent of Florida attorneys. He has handled over 2,000 personal injury and wrongful death cases throughout Florida. For a free and confidential consultation to discuss your legal rights, contact the Spivey Law Firm, Personal Injury Attorneys, P.A., in Lee County at 239.337.7483 or toll free at 1.888.477.4839,or by email to Randall@SpiveyLaw.com. Visit SpiveyLaw.com for more information. You can contact Spivey Law Firm, Personal Injury Attorneys, P.A.in Charlotte County at 941.764.7748 and in Collier County 239.793.7748.